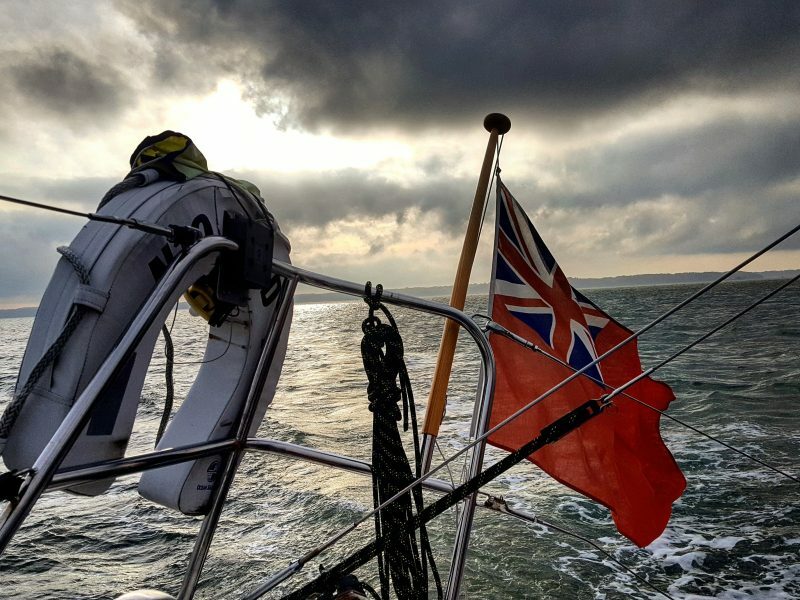 With all the planning and saving it’s been easy to forget why we’re doing this and going sailing for the first time was just the adventure we needed.. Both of our lives have changed drastically over night, in so many ways. It has been a hard few months. Very hard. Adam and I have had to adapt to this new way of life, worrying together that we won’t be able to make this happen, changing plans and then changing them again. We have had to become professional financial advisers, therapists, builders and teachers (to each other). It’s easy to forget that we’re also meant to be having fun together. 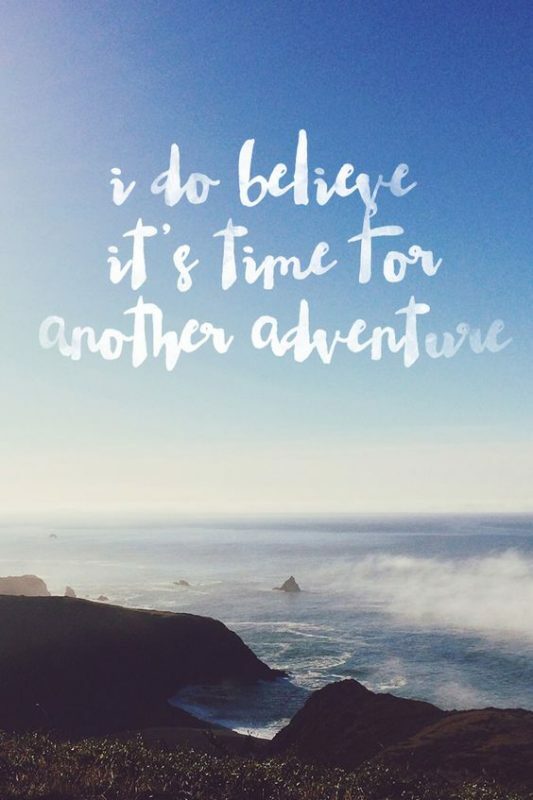 Surely that’s the reason people quit their jobs to travel the world, right? Luckily, as mentioned in my previous post, we have some pretty awesome friends. Tom, one of Adam’s friends from way back in the day, has been our go to for sailing advice and support. When he offered to take us out for a lesson I imagine the conversation between him and Adam went something like this…. The conversation between Adam and I went more like this…. Adam: Do you want to go sailing with Tom soon? Me: How soon? He does know it’s November, in England? 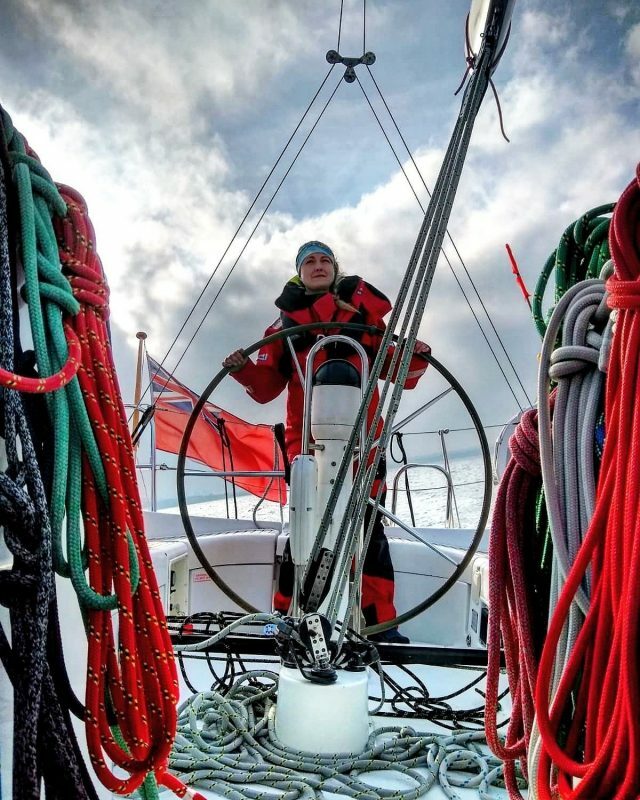 Adam: Yeah I’ll find out…..Ok, so it has to be this weekend, or the sailing season is over. The sailing season for real sailors is over. The season where people who are fully trained with experience in all sorts of weather, is over. The morning we left there was ice stuck to the inside of the boat, it was barely possible to walk on the wooden board walks of the marina for fear of falling and breaking your neck and I was convinced that the sea would be frozen over. But fun and adventure or whatever, so off we went. We were off for our first time sailing. The first time sailing for anyone should be a good one. We were excited about our first time sailing. 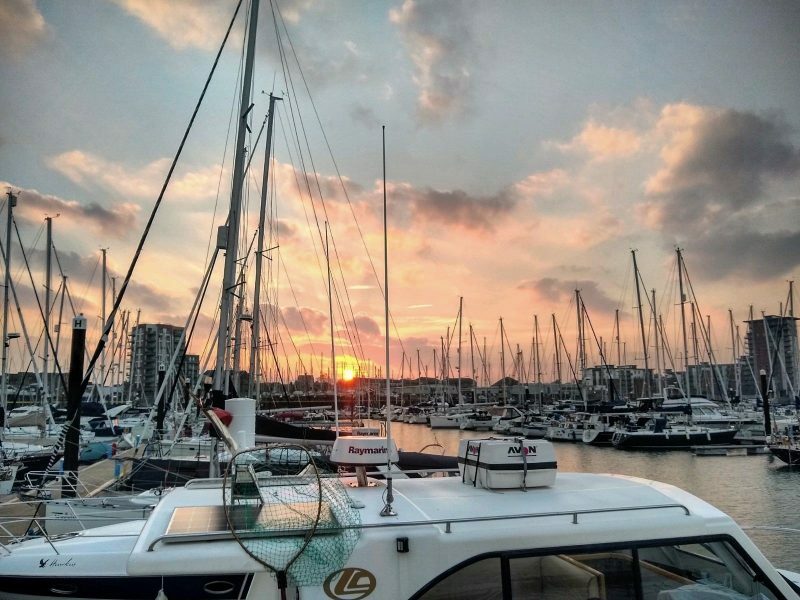 If you would like to know what our first time sailing was like then read on! We arrived at the boat as the sun was setting. Rocking masts were set against a pink, orange sky and the cold was momentarily forgotten. Tom ‘showed us the ropes’ (queue laughter) and we familiarised ourselves with as much of the boat as possible before heading out the next day. We spent time chart plotting, calculating tides and currents and Tom explained the basic rules of the sea. It was a lot to take in. Luckily Tom is a natural teacher and never once made my endless stupid questions feel stupid (thanks Tom!) After several hours in class we decided to really ‘push the boat out’ (haha) and spend some of our ‘slush fund’ on dinner at a local (warm) pub. We were having our first time sleeping on a sailboat. The first time spending a whole night on a sailboat. The sailboat bed was comfy. We wanted to sleep well on our sailboat. After an excellent nights sleep (genuinely, I was actually pretty warm!) we got ready to set sail. Motoring out of the port we stayed clear of some huge boats and some brick walls and headed out into the open sea. 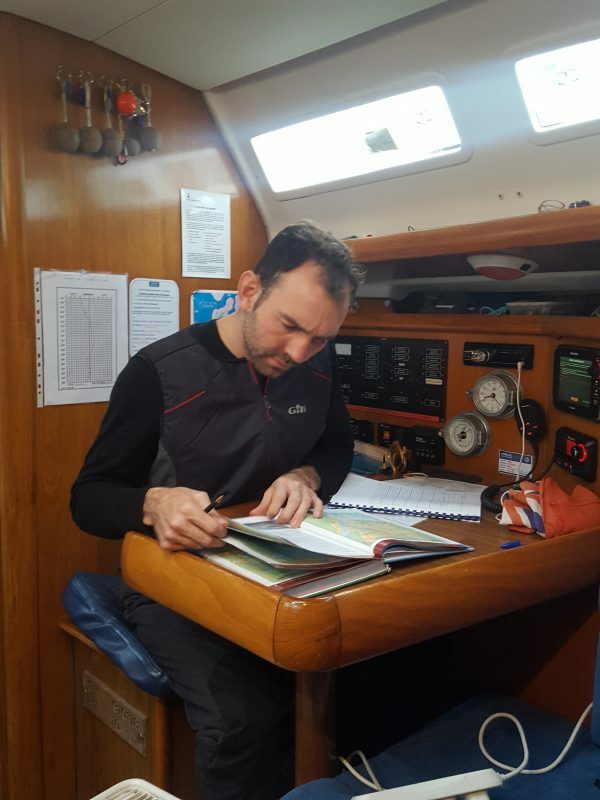 There was a small moment of panic when Adam thought he was steering us straight into a sandbank while Tom and I were busy trying to get the sails up, but Tom patiently explained that the depth sounder reads the depth from below the boat and Adam got us back on course. With a bit (a lot) of faffing from me we had the sails up in well over record time and we were finally sailing! Easy as that. Though I’m not sure experienced sailors would call it sailing, maybe sitting in the ocean with the sails up, but still. It took us a few attempts to work out which way to point the boat to get some wind in our sails and it was constantly ‘touch and go’ as to whether we would cause the boat to gybe by accident, but with Skipper Tom in charge we made our way safely to the next harbour where we had planned to stop for lunch. We were stopping for lunch for the first time on a sailboat. This would be the first time on a sailboat that we would eat lunch. I would have to cook for the first time on a sailboat. I didn’t know how hard it would be to cook for the first time on a sailboat. On a sailboat we would find it hard to cook so I was a little scared but actually cooking on a sailboat was ok. Unfortunately Tom isn’t used to sailing with two complete idiots, so it took longer to get there than he had hoped. (He very tactfully claimed the wind had dropped and the tides were strong but we knew what he meant.) So I was cooking pasta and sauce for three while cruising. No problem. Unless the stove breaks. And the boys decide that the best time to practice single handed tacks is while I’m in the galley clinging onto pans of boiling water. But it can’t all be ‘plain sailing’ can it!? Luckily I wasn’t made to ‘walk the plank’, although I did get a bit of a ‘dressing down’ from Tom about the state of the kitchen. Definitely not ‘ship shape and Bristol fashion’ down there by the time I’d finished. With full tummys and a bit more experience under our belts it was ‘smooth sailing’ back to the marina. Although it was cloudy there was a beautiful, moody light on the water as the sun was setting and no one else in sight. Just the sound of the sails and the waves, and the delicious feeling of adventure yet to come. We couldn’t wait for the next adventure sailing. We knew that the next time sailing on a yacht would be exciting and adventurous. We would have to learn to sail quickly and be adventurous and intrepid. Our sailing adventure was just round the corner! How exciting that soon we would be on our very own sailing adventure. Thanks so much to Tom who made us feel capable, trusted and at ease. We hope one day you will have the chance to inspire others as you have us. If you would like to find out all about the sayings we use that come from sailing (because my sailing themed commentary was so hilarious) you can find a wealth of information here.